National Roller Coaster Day was celebrated in a big way on Aug. 16, when California’s Great America introduced its newest coaster, RailBlazer. Manufactured by Rocky Mountain Construction, RailBlazer is a prototype coaster based on RMC’s new “Raptor” model. Eight riders will traverse in a single file train on a single rail, giving riders a unique perspective as they plunge down a 90-degree first drop. After a 45-degree lift hill that reaches a height of 106 feet, RailBlazer travels at a top speed of 52 mph, with an abundance of airtime, three inversions and a zero gravity roll. “RailBlazer is a revolutionary roller coaster concept that will be an intense and exhilarating ride experience for our guests,” said Raul Rehnborg, vice president and general manager of California’s Great America. 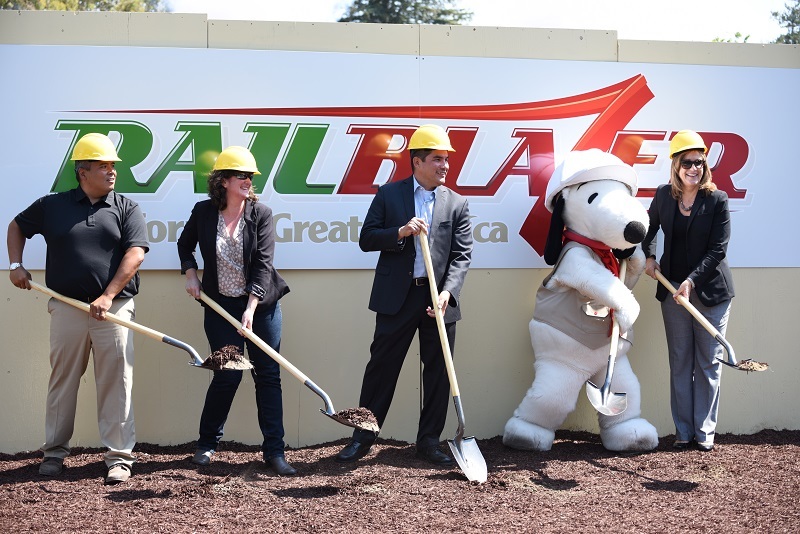 RailBlazer honors the “trailblazer spirit” of California and the Bay Area, Rehnborg said. It celebrates the Bay Area and Central Coast’s scenery that is connected by State Route 1, or SR1, which was the ride’s codename in the months before it was announced. But at Great America, Rehnborg noted, SR1 has a few different meanings: Steel Route 1, Steel Rail 1 and Single Rail 1. Themeing elements of the ride include a natural waterway, rocky surroundings and a trailhead marquee sign designed to mark the beginning of the journey. At the bottom of the first drop, the train zips through a rocky tunnel at top speed. Great America invited members of the American Coaster Enthusiasts to the unveiling event on Aug. 16. ACE member Barbara Lawson spoke on stage and thanked the park for inviting ACE to participate. After the new coaster was unveiled, ACE member Brian Laschkewitsch said he was looking forward to the single rider aspect of RailBlazer, and praised Great America for its new master plan, which was approved by the Santa Clara City Council in January. The plan allows Great America to build taller rides, add an entertainment district outside its front gates, and have a longer operating season, among other things. RailBlazer is the first new attraction to be announced as part of the master plan and re-zoning approval. Rehnborg estimated RailBlazer to open in spring 2018, likely before Memorial Day Weekend. Ground clearing is currently underway, with steelwork expected to commence in October.